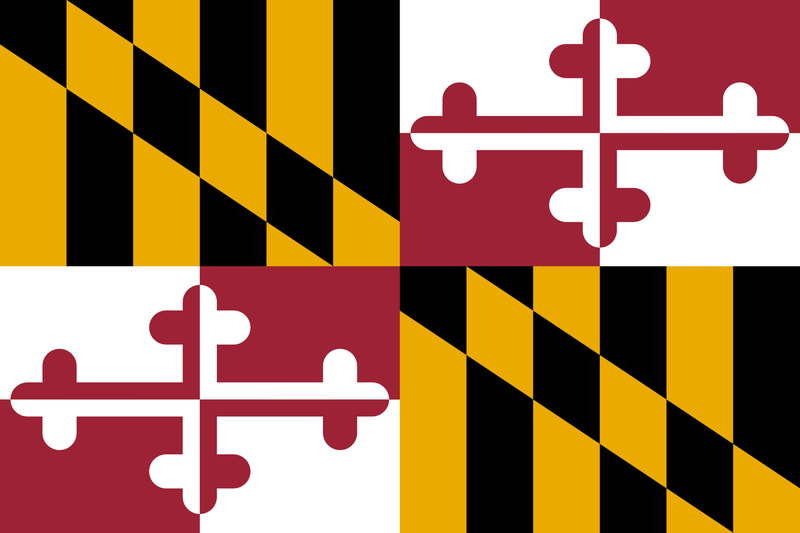 Nicknamed "The Old Line State", Maryland was first founded as a colony in 1634. It became the seventh U.S. state in 1788. The oddly-shaped state is also dubbed "America in Miniature", with its huge variety of landforms and landscapes: the tall mountains of Western Maryland, the Piedmont Plateau north and west of Baltimore, the suburban regions of Baltimore and Washington, D.C., and the Chesapeake Bay coastal plain of the Eastern Shore and Southern Maryland. The state's largest city is Baltimore, while its capital is Annapolis. Maryland is served by a wide array of Interstate Highways and U.S. routes. Interstate 95 and U.S. Route 1 head out of Delaware and Pennsylvania, respectively, through Cecil and Harford counties, then bisect Baltimore city and parallel each other in between Baltimore and Washington, D.C. Imterstate 70 begins just west of Baltimore, heads past Frederick and Hagerstown, and shoots northward into Pennsylvania at Hancock in Washington County. Interstate 68 picks up where I-70 leaves off to serve the rest of Western Maryland. Interstate 83 stems from downtown Baltimore and cuts northern Baltimore County in half before entering Pennsylvania, and the short Interstate 97 in Anne Arundel County links Baltimore and Annapolis. U.S. Route 40 parallels I-68, I-70 and I-95 over a path exceeding 200 miles through the state, while also passing through Baltimore. Interstate 81 and U.S. Route 11 cut through a narrow part of Washington County and form a north-south corridor through Hagerstown. U.S. Route 13 and U.S. 113, which split in Worcester County's Pocomoke City, provide north-south routes though the lower Eastern Shore. U.S. Route 50 connects Washington, D.C. with Annapolis, the Chesapeake Bay Bridge and Ocean City, while U.S. Route 301 links the upper Eastern Shore, Annapolis and Southern Maryland. Three-digit interstates in Maryland include the Interstate 695 Baltimore Beltway and Interstate 495 Capital Beltway, the Interstate 895 Harbor Tunnel Thruway, the hidden Washington-Annapolis Interstate 595, and the Washington-Frederick Interstate 270. Other expressways in Maryland include the Baltimore-Washington Parkway, formed in 1950 and partially owned by the National Park Service; Maryland routes 10, 32, 100 and 200 in between Baltimore and Washington; the U.S. Route 13/50 Salisbury Bypass; and Maryland Route 90 in between Ocean Pines and Ocean City. For Maryland state route photo guides, click a county below.